University of the Fraser Valley, Department of Kinesiology, Chilliwack, BC. Contemporary research reveals that anxiety and depression are prevalent among students in health care training, and movement-based or mindfulness self-care practices may help bolster mental well-being. The traditional Chinese exercise Baduanjin has been shown to improve mental health but has not been studied with nursing students in this regard. The aim of this study was to compare self-reported depression, anxiety, and stress symptom levels in third-year bachelor of nursing students before and after eight weeks of introductory Baduanjin practice. Six third-year bachelor of nursing students volunteered to participate. The 21-item Depression, Anxiety, & Stress Scale was completed before and after eight weeks of learning and practicing Baduanjin. After completion of the program, subjective comments from students were also obtained. Post-intervention scores were lower for each participant’s depression and stress scales, and their composite scores; all group mean scale and composite scores also reduced. Subjectively, all participants felt the practice helped them manage stress and indicated they felt it benefited them. Some indicated it wasn’t always easy to find the time or energy to practice, while other comments noted it aided with sleep, helped manage a chronic health condition, or that they could study with more focus following practice sessions. Following eight weeks of learning Baduanjin, self-reported levels of depression, anxiety, and stress were reduced despite temporal proximity to the academic exam period. The results of this pilot study suggest further investigation of this gentle self-care practice for nursing students and practitioners is warranted. It has long been advocated that those who provide health care for others should also attend to their own health needs1,2. Undergraduate nursing programs have been designed to include the topic of self-care, generally with regard to its subsequent relevance for fitness to practice3,4. However, students should not underestimate the value of self-care before they gain professional status. Research suggests nursing students would likely derive some benefit from self-care practice during their undergraduate years as well5,6. Survey responses from almost 500 post-secondary education counseling centers in the United States, Canada, Europe, the Middle East, Asia, and Australia, reveal that among college students using campus counseling services, anxiety continues to be the most predominant and increasing concern, closely followed by depression7. In a study by Chernomas et al.8 nursing students’ self-reported symptoms of stress, anxiety, and depression were significantly more severe compared with a mix of university students and the general workforce. Investigating the global prevalence of depression among nursing students through a systematic review and meta-analysis, Tung et al.9 determined that there is a slightly higher prevalence of depression among nursing students than the general student population, noting that age and geographical region appear to influence the rate of occurrence. A recent literature review identified that nursing students frequently experience high levels of stress and anxiety, particularly when undertaking clinical placements and that these feelings can negatively impact their sleep patterns, well-being, learning, performance, and professional growth. Further, once in the work force, high levels of stress, anxiety and depression can diminish the satisfaction that nurses derive from their work, the quality of care they provide to patients, and can also contribute to emotional exhaustion and burnout10. Turner et al.11 conducted a review of intervention strategies addressing stress and anxiety among nursing students. While some significant support was found for interventions aimed at stressors or coping, no conclusion could be reached on what types of intervention were most effective. While many coping strategies are based on mindfulness practices, it has also been suggested that undergraduate nursing students, as with the general population, can improve their mental well-being through engaging in physical exercise12. Despite learning the benefits of exercise in the context of self-care, two-thirds of student nurses report not engaging in adequate amounts of exercise13. Regarding practicing nurses, increased exercise participation is dependent on one’s perceptions of exercise, self-efficacy and social support as well as motivation to participate in exercise, with other perceived barriers including inaccessibility of facilities, cost, lack of energy, and health reasons14. In light of this, when planning self-care prevention or intervention programs, consideration must be given to these barriers. Chinese qigong is a many-branched system of self-care developed over thousands of years in Asia, and as such can be considered a form of ‘evolved’ exercise. One popular style of qigong is called ‘Baduanjin’ (Eight Brocades); it is relatively easy to learn and perform, and research indicates regular practice is associated with physical and mental health benefits15,16. Furthermore, it may overcome many of the barriers to exercise noted above. The eight routines involve very basic motor skills, with mobility and stability demands falling within the ranges of normal activities of daily living, and routines can be modified to meet special physical needs17. This simplicity, coupled with no requirement for special equipment, clothing, or facility, may promote a sense of self-efficacy with the exercise. One can practice individually or in groups, according to preference and group availability. Many instructional videos describing how to develop a practice of Eight Brocades are freely available on the internet. Cheng18 reviewed the English and Chinese academic literature regarding the effects of Eight Brocades for psychological health, finding it very suitable for the promotion of mental well-being. Specifically with regard to college students, Li et al.19 conducted a randomized controlled trial finding Eight Brocades practice associated with significant improvements in some physical outcomes as well as attention, but they did not find significant reduction in self-reported symptoms of stress. The methodology used in that trial required the exercise group participants to practice for a one-hour duration five days per week. Conceivably, not many nursing students or practitioners would be willing to commit an additional five hours of activity to their weekly schedule. Studies have shown perceived lack of time is a significant reason why nursing students fail to employ coping strategies like physical or mental exercise6,12,13,20. Many studies of Eight Brocades have used shorter practice session duration18,21. These considerations lead the author to consider if using shorter duration Eight Brocades practice sessions with nursing students would have self-care benefit. The purpose of this study was to compare self-reported depression, anxiety, and stress symptom levels in third-year bachelor of nursing students before and after eight weeks of introductory Eight Brocades practice. Students in year three (semester six) of the Bachelor of Science in Nursing program were invited to participate in this study, which was approved by the institution’s human research ethics board and is in accordance with the Helsinki Declaration of 1975, as revised in 2008. Recruitment involved providing a two-minute overview about the study in a year three (semester five) course servicing all students who would be in semester six the following academic term. Those interested were invited to an information session on campus to ask and learn more about participating in the study, as well as observe a demonstration of the exercise. Prospective participants were excluded if undertaking or altering another program of self-health promotion, undergoing mental health counseling or treatment during the study, or if suffering from musculoskeletal system disease or injury. Three weeks into the new semester, five students (four female, one male) attended a twenty-minute session on campus during their lunch break to provide written informed consent and anonymously complete the pre-intervention measurement utilizing the abbreviated Depression Anxiety Stress Scale (DASS-21)22. The DASS-21 is a set of three self-report scales designed to measure the states of depression, anxiety and stress. Subjects use 4-point severity/frequency scales to rate the extent to which they have experienced each state over the past week. Once completed, each scale has a numerical score associated with each construct such that higher scores are indicative of higher levels of the construct. The DASS-21 has seven items per scale, and totals are doubled for comparing results with the full 42-item DASS. The DASS is considered preferable for clinical work, and the DASS-21 is deemed more suitable for research purposes, having the same factor structure, with similar results to the full DASS, but strategically involving only a select half of the questions used in the full scale. The scales have been shown to have high internal consistency and are useful to measure change in state over time22,23. Participants normally met as a group with the Eight Brocades instructor twice per week to learn and practice the routine for 20 minutes during their 60-minute lunch break; program demands occasionally allowed for only one meeting per week. For these sessions, the group met in a classroom with tables and chairs cleared to the sides. In addition to the participants of this study, three or four faculty members often joined the group for practice. No data were collected from faculty. Participants were asked to also practice for 15-20 minutes, three to five times per week on their own, and were given a document with summary guidelines for the practice, as well as a short video demonstrating the exercise set. No incentives were provided. The method of Eight Brocades used for this study was the version developed by the Chinese Health Qigong Association24; this is the standardized style recommended for researchers to enable consistent methodology across studies25. The Eight Brocades instructor formally received training from a qigong master at a university in China, and at the time of this study had over 15 years experience with practice and teaching the routine. After eight weeks of guided practice the intervention was concluded and the five participants once again completed the DASS-21 in an unused classroom during their lunch break. Participants used pseudonyms known only to themselves to enable the matching of pre and post intervention data. Another student participated in the study but was late to join the group. While no pre-post DASS-21 data were collected from this participant, all six were provided a questionnaire during the final data collection session asking a set of open-ended questions regarding their experience with the program and felt benefits. Regarding the DASS composite scores, the group mean and each individual participant’s three-scale total and mean at pre-intervention was greater than at post-intervention (Table 1). 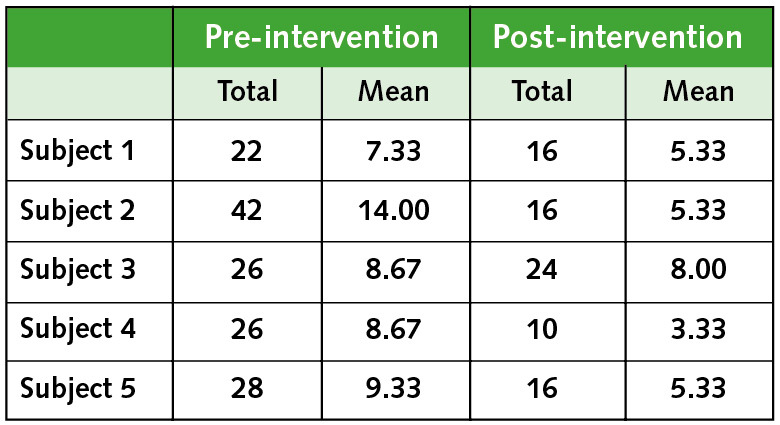 Only one participant scored higher at post-intervention, for whom the anxiety dimension scale score rose from 2 (pre-intervention) to 4 (post-intervention). For each of the three scales (depression, anxiety, stress), group mean scores were less following the Baduanjin intervention period (Table 2). 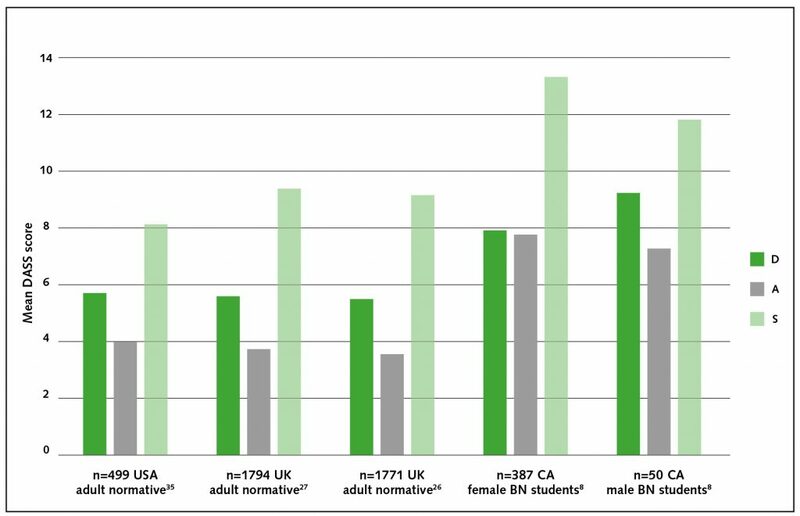 Additionally, when compared with normative means (Fig 1), the pre-Baduanjin scores were higher than those of the general adult population and after Baduanjin were comparable with the least of the normative means. Figure 1. Mean DASS scores for general adult (normative) and nursing student populations8,26,27,35. Regarding the second questionnaire, all six participants answered affirmatively to the question ‘Do you feel the Eight Brocades practice was beneficial for you?’. With the opportunity to elaborate, all six participants included statements associated with stress relief; individual comments noted that it helped them relax, or unwind, or feel calm, or relieve tension. Half of the participants indicated practice before bed helped make falling asleep at night easier. Other individual comments were: ‘it left me better able to manage and cope with stress’; ‘better stress management especially after a session’; ‘I would incorporate it into breaks when writing a paper and found this helped me focus better on the writing task’; ‘helped ground me; helped manage chronic disease symptoms’. Answering the question ‘If there were any factors challenging your adherence to the practice schedule, what were those?’, participants wrote comments that could be categorized as either: no challenge (eg. it was quite easy to find 15-20 minutes for this), finding or making time (eg. missing class due to Nursing program meeting; chose to do it before bed which became a stressor when busy as it was one more thing to do before bed), or being tired or unmotivated (eg. most difficult after a clinical shift when fatigued). The purpose of this study was to compare self-reported depression, anxiety, and stress symptom levels in nursing students before and after eight weeks of introductory Eight Brocades practice. Each participant’s composite DASS score was lower following the exercise program (see Table 1), meaning there was a reduction of symptom severity during the last week of practice sessions compared against the week prior to session start-up22. Additionally, each participant’s composite total started above and finished near or below the adult normative composite total mean of 18.38 reported by Crawford et al.26. Regarding the individual DAS scales, the pre-intervention mean for each scale was higher than normative means26,27. This finding is supported by other research. Chernomas et al.8 used the DASS with students in years 2-4 of an undergraduate nursing program. Their data set (from 50 males and 387 females) showed mean scores significantly higher than normative scores except for the male stress scale mean, and are comparable to the current findings at pre-intervention (see Figure 1). A systematic review and meta-analysis of 27 studies investigating depression among students in nursing programs, concluded that there indeed is a high prevalence of the illness among nursing students, noting the pool of findings underscores the need for interventions to reduce stress, anxiety, and ultimately depressive symptoms among this population9. The current findings suggest there may be an association between this traditional qigong exercise and nursing students self-reporting diminished symptoms of depression. In accordance with the principles of qigong and the Eight Brocades program implemented in this study, this exercise program encouraged regulating mental activity during practice. Once the basic movement patterns appeared to be understood, the group discussed potential foci of thought to be mindful of while performing the routines. Studying the development of mindfulness in college students through movement-based courses, Caldwell et al.28 found that the qigong method Taiji can increase mindfulness, and that increasing mindfulness accounts for positive changes in mood and perceived stress. Those subjects practiced for 15 weeks, meeting twice per week for 50 minutes each time, a more intensive program than in the present study. Measures of mindfulness were not captured for this study and it is unknown if the participants actually regulated mental activity or not. Future studies of movement-based interventions would benefit from gathering such data. Whether practicing mindfully or not, the participants did perform the physical activity of the routine. The effect of exercise with regard to mental health is not unequivocal, given the broad parameters of exercise (frequency, intensity, duration, type) and the complexity of mental health and illness. Yet, it has been demonstrated that even mild exercise can alleviate symptoms of depression29, and the Eight Brocades gentle form of exercise has been found in a number of studies to significantly reduce symptoms of depression, anxiety, and stress18. Such changes were observed in this present pilot study, with reductions of depression, anxiety, and stress symptoms following the relatively brief intervention schedule, although the small sample size limits comparison and interpretation. With regard to the qualitative data, half of the participants indicated practice before bed helped with falling asleep at night easier. Similar results were reported in a randomized controlled trial, indicating significant improvement in sleep following just four weeks of Eight Brocades practice, with the effect sustained through the remainder of the 12 week trial15. While students may value such an outcome, it would also have benefit for practicing nurses. Cheung et al.30 found two-thirds of nurses they studied (n=850) reported sleep problems, with nearly half of those reporting depressive symptoms. Their multivariate analysis found sleep problems significantly correlated with depression and anxiety. Another interesting data point in this study that would likely apply to practicing nurses is the comment from one participant that following the use of Eight Brocades during their break from the work of studying, they were revitalized and much more focused in their subsequent study period. This same finding was reported in a study investigating the use of Eight Brocades with counseling students, who stated that after practice they were better able to concentrate and do what was necessary while remaining calm31. Informing students that exercise will probably help them feel and sleep better is one thing, but framing it in terms of grades could be very motivating. Can improving DASS scores improve grade point average (GPA)? Using multiple regression analysis, Floyd32 found that DASS scores contribute significantly toward predicting nursing students’ GPA’s, with higher DASS scores associated with lower GPA. Regarding a relationship between DASS scores and academic performance, it would seem pertinent to take into account when the DASS data are collected. Unfortunately, this is rarely reported. Kulsoom et al.33 found medical students’ DASS-21 scores elevated in the two to three weeks prior to major examinations, compared with during the regular class term. Similarly, Gorynska et al.34 found the tense arousal mood dimension (contrasting tension and nervousness with relaxation and calmness) in college students was significantly elevated just prior to exams compared with during the regular lecture schedule. These results contrast sharply with the present findings of DASS scores being lower at three weeks before major examinations (after the program) compared with three weeks following the commencement of the academic period (the baseline assessment). A significant limitation of this study is that participants came from a small convenience sample of third year nursing students at one western Canadian university; the methodology exposes the study to a self-selection bias and prevents generalizability. Daily activity levels over the course of the intervention were not monitored, and the precise frequency, intensity, and duration components of the exercise for each participant are not known. The DASS-21 tool involves self-reported measures with regard to the past week and is not a clinical evaluation. Looking ahead to future work in this area, researchers might consider other methods of implementing the Eight Brocades program. Relying on the weekly gathered presence of instructor and students can be a formidable constraint; access to local instructors will simply not be feasible in some regions, and recruiting students for such extracurricular participation has its own challenges. Providing self-guided instruction through audio-visual resources available online may be a suitable alternative. While this will afford participants some flexibility for when they study and practice, it would be prudent to provide a regular optional time and space for participants to practice and learn together, as the shared collective experiences may facilitate learning. Some other considerations for future studies are to include measures that may address the role of self-regulation, such as heart rate variability and mindfulness, as well as collecting academic information for student participants such as grades, and recording the point in the academic term at which the data were collected. Following eight weeks of learning and practicing a simple, self-regulating, evolved exercise known as Baduanjin, composite and individual depression, anxiety, and stress scale scores had reduced, with notable improvements reported for stress management, sleep, and focus. The results of this pilot study suggest further investigation of the potential benefits from this self-care practice for nursing students and practitioners is warranted. Statement of Interests: The author declares he has no conflict of interest (personal or funding) in the publication of this work. It received approval (713K-14) from the University of the Fraser Valley Human Research Ethics Board. Mills J, Wand T, Fraser JA. On self-compassion and self-care in nursing: Selfish or essential for compassionate care? Int J Nurs Stud. 2015 Apr 1; 52(4):791-3. Ashcraft P. Gatto S. Care-of-self in undergraduate nursing students: a pilot study. Nurs Educ Perspect. 2015; 36(4):255-256. Nevins CM, Sherman J. Self-care practices of baccalaureate nursing students. J Holist Nurs. 2016 Jun; 34(2):185-92. Chernomas WM, Shapiro C. Stress, depression, and anxiety among undergraduate nursing students. Int J Nurs Educ Scholarsh. 2013 Nov 7; 10(1):255-66. Tung YJ, Lo KK, Ho RC, Tam WS. Prevalence of depression among nursing students: a systematic review and meta-analysis. Nurse Educ Today. 2018 Apr 1; 63:119-29.
van der Riet P, Levett-Jones T, Aquino-Russell C. The effectiveness of mindfulness meditation for nurses and nursing students: An integrated literature review. Nurse Educ Today. 2018 Mar 24; 65:201-11. Turner K, McCarthy VL. Stress and anxiety among nursing students: A review of intervention strategies in literature between 2009 and 2015. Nurse Educ Pract. 2017 Jan 1; 22:21-9. Hawker CL. Physical activity and mental well-being in student nurses. Nurse Educ Today. 2012 Apr 1; 32(3):325-31. Chow J, Kalischuk RG. Self-care for caring practice: Student nurses’ perspectives. Int J Hum Caring. 2008; 12(3):31-7. Kaewthummanukul T, Brown KC, Weaver MT, Thomas RR. Predictors of exercise participation in female hospital nurses. J Adv Nurs. 2006 Jun; 54(6):663-75. Chen MC, Liu HE, Huang HY, Chiou AF. The effect of a simple traditional exercise programme (Baduanjin exercise) on sleep quality of older adults: a randomized controlled trial. Int J Nurs Stud. 2012 Mar 1; 49(3):265-73. Cheng FK. Effects of Baduanjin on mental health: a comprehensive review. J Bodyw Mov Ther. 2015 Jan 31; 19(1):138-49. Chinese Health Qigong Association. Baduanjin: eight section qigong exercises. London: Singing Dragon; 2008: 64 p.
Antonishen K. Exercise mode heterogeneity among reported studies of the qigong practice Baduanjin. J Bodyw Mov Ther. 2015; 19:278-283. Crawford JR, Henry JD. The Depression Anxiety Stress Scales (DASS): Normative data and latent structure in a large non-clinical sample. Br J Clin Psychol. 2003 Jun; 42(2):111-31. Caldwell K, Harrison M, Adams M, Quin R, Greeson J. Developing mindfulness in college students through movement-based courses: Effects on self-regulatory self-efficacy, mood, stress, and sleep quality. J Am Coll Health. 2010; 58:433-442. Stanton R, Reaburn P. Exercise and the treatment of depression: a review of the exercise program variables. J Sci Med Sport. 2014 Mar 1; 17(2):177-82. Cheung T, Yip PS. Depression, anxiety and symptoms of stress among Hong Kong nurses: a cross-sectional study. Int J Environ Res Public Health. 2015 Sep 7; 12(9):11072-100. Chrisman JA, Chambers Christopher J, Lichtenstein SJ. Qigong as a mindfulness practice for counseling students: A qualitative study. J Humanist Psychol. 2009 Apr; 49(2):236-57. Kulsoom B, Afsar NA. Stress, anxiety, and depression among medical students in a multiethnic setting. Neuropsychiatr Dis Treat. 2015; 11:1713. Abstract received April 18, 2018 from Academic Search Complete database. Gorynska E, Winiewski M, Zajenkowski M. Situational factors and personality traits as determinants of college students’ mood. Pers Individ Dif. 2015 Apr 1; 77:1-6. Sinclair SJ, Siefert CJ, Slavin-Mulford JM, Stein MB, Renna M, Blais MA. Psychometric evaluation and normative data for the depression, anxiety, and stress scales-21 (DASS-21) in a nonclinical sample of US adults. Eval Health Prof. 2012 Sep; 35(3):259-79. doi:10.1177/0163278711424282.